Thinking back, I honestly don’t remember how Tom Griffin, aka the Barrel Guy, even landed on my radar. He flies under almost every radar. 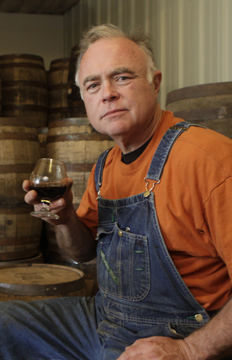 This one guy–he doesn’t like the term barrel broker because spent barrels are more like a canvas to him than a commodity–helped shift the direction of the craft beer business in the 21st century but no one outside the brewers really knew about it. Certainly no one had written about him. Nor was he trying to be written about. I think it was an off-handed comment by Matt Brynildson, Firestone-Walker’s brewmaster, where I casually heard his name and some time later that set me off looking for him, but he doesn’t have a website or anything. That’s why how we first met face to face is part of this story, my first for DRAFT Magazine (vol. 5.4, July, 2010). Of course, it’s just the tip of the iceberg, but this remains one of my favorite stories. Cheers to Tom, wherever he may presently be driving. This entry was posted in Draft Mag, Feature, Profiles and Q&As and tagged barrel-aged, clip, Firestone Walker, Goose Island, San Francisco, Tom Griffin by Brian. Bookmark the permalink.